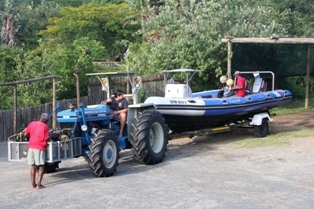 The dive centre is situated right next to Rocktail Camp. Divers meet at the dive centre to kit up, get changed into wetsuits and receive a dive briefing before being driven along the beach to the boat launch site at Island Rock. The dive centre has tea & coffee facilities and mens and ladies ablutions with hot showers. We also have a library of fish books for reference when logging dives and a well stocked dive shop filled with t-shirts, rash vests, masks, snorkels, log books, dive computers, batteries, sun cream and various other items for purchase. Please remember to bring your dive certification cards with you (and your log books if you have them) - no dive card = no dive! We operate two 8 metre rubber ducks (ribs / zodiacs) both equipped with all safety requirements including life jackets, oxygen and radio contact. We launch our boats from Island Rock, which forms a channel running parallel to the beach. The boats are anchored in this channel and all dive equipment is loaded, ready and waiting for divers to arrive. Divers are driven down to the launch site and then wade out about waist deep in the water and jump aboard. We don life jackets and hold on for the exciting surf launch. Most dive sites are a 5-10minute boat ride and a couple of further dive sites take 15-20minutes to get to. After the first dive we return to the beach where guests enjoy a picnic breakfast / brunch while we re-kit the dive equipment for the second dive. After the second dive we return to the dive centre for hot showers and a cup of tea or coffee. We have a full range of well maintained dive equipment for hire. We use Aqualung Titan regulators and Seaquest Wave BCD's to ensure that divers have the best dive equipment. 5mm thick, full length wetsuits are used year round as well as closed heel fins. We have 10L and 12L steel dive cylinders available. We will get your BCD's, regulators and cylinders kitted up for you and ensure that they are loaded onto the boat, we will also load your weight belt for you so that you just need to try on wetsuits, fins and masks at the dive centre before being driven down the beach for your dive. After your dives we will wash and hang all your dive gear ready for your next days diving.